For any manufacturer to remain competitive in the market, they need to work hard towards increasing their operational excellence, reduce their order cycles and generate more revenues. Manufacturing software solutions offer various tools that are designed to enhance production performance as well as quality while achieving enterprise requirements. Ready to implement a manufacturing software in your enterprise, but don’t know where to start from? Then, get a feel for the various ERP software solutions available for manufacturing businesses by checking out these 10 best options. 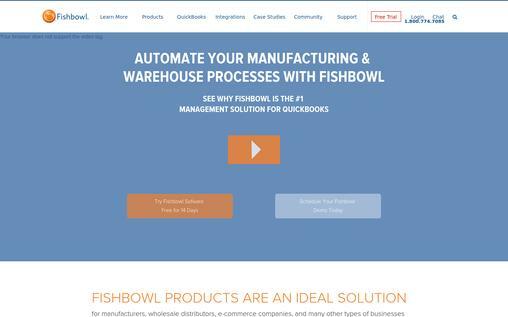 Fishbowl Manufacturing has been designed to meet the needs of small and medium-sized firms that need a comprehensive inventory management system without getting rid of QuickBooks for their accounting needs. It’s easy to deploy, very affordable with flexibilities to meet the needs of firms that are after more streamlined material requirements planning, inventory control and manufacturing execution. It is used by almost every type of industry that makes revenue of more than $100 million per annum. Advance options under a bill of materials – Fishbowl Manufacturing utilizes the simple formats of lists to enable users to add instructions to every step of a manufacturing process in a bill of materials. Manufacture orders – these help you in organizing various work orders. Users simply need to select specific jobs that they want to employ a manufacturing order, then pick the appropriate bills of materials to use. Auto generates purchase orders – Fishbowl can identify a deficiency in raw materials and create a purchase order for those particular raw materials. Creating work orders for multiple jobs – Fishbowl allows manufacturers to repair, disassemble, replace or customize products and parts during a manufacturing process. 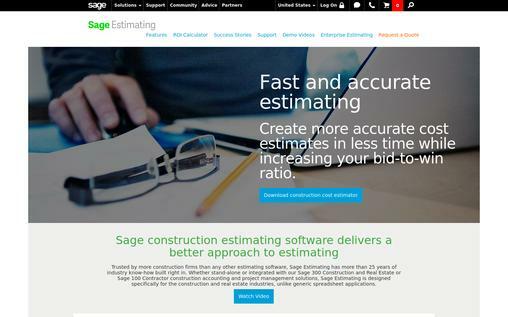 Final costs estimation – the software integrates with an online system which helps you to accurately estimate costs of materials used in production. Printing invoices – integrates easily with QuickBooks so you can make changes to ledgers and generate invoices quickly. Fishbowl has a starting price of $4,395 and becomes even cheaper as you include more users. Pricing is based on the number of users and support plan. EnterpriseIQ ERP by IQMS is specifically built to meet the manufacturing needs of small, medium as well as large batch process manufacturing firms across various industries. Some of the industries that can find this software useful include the foods and beverages, medical devices, automotive, plastics, electronics aerospace and packaging. Deployment can be done on premise or on cloud. It can be used for enterprise resource planning, manufacturing operations functionality, reporting, business intelligence, supply chain, warehouse and shipping management. Manufacturing operations functionality – EnterpriseIQ can help manufacturers integrate their project engineering with their manufacturing process. Enterprise resource planning – gives the capability to manage as well as track the project costs by effective planning for how resources are utilized. Production planning and scheduling – complex and long manufacturing processes can easily be planned and scheduled to take place in a procedural manner. Shop floor control – makes it possible to manage all the operations of manufacturing and sales in real time. Warehouse and shipping management – management of inventory in warehouse becomes easier and shipping orders scheduled to take place in order of the purchase requests. EnterpriseIQ has many more attractive features for manufacturers that are worth taking note of. Pricing plans are offered with lots of flexibility. Actual price quotes can be requested by contacting IQMS. 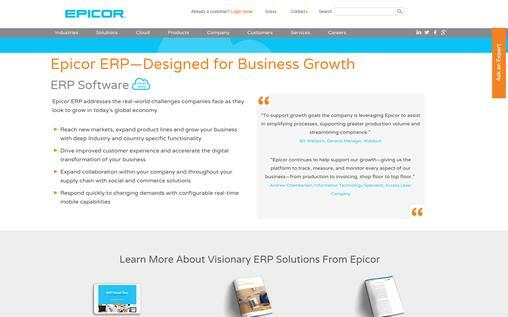 Epicor ERP presents a comprehensive ERP solution that features a lot of functionalities for inventory control, accounting, manufacturing execution and pre-production materials planning. It can be deployed on-premise, on a cloud or hosted. Epicor ERP is a modular based software solution, meaning that users can purchase the modules that they only need without necessarily purchasing the entire system. It’s an ideal solution for any type of manufacturer with over $1 million annual revenue. Production process management – Epicor ERP lets you track, assess and monitor all production processes, from the shop floor to the top floor, raw materials to the final product. Business process visibility – lets manufacturers boost their efficiency with the real-time and actionable visibility into business operations. Customer relationship management – this module helps you enhance your business relations with your customers and partners. Quality performance management – manufacturers can identify and assess the quality of their production processes so as to meet high standards of production. Product lifecycle management – this module helps you determine the best production times that will guarantee a longer life of your products before they are sold out. Epicor ERP has several other modules including supply chain management which can all be purchased as a single suite or according to demand. Pricing plans are offered by the developer upon request. A SAP is a renowned leader in ERP software solutions. SAP Manufacturing is a software solution for the enterprise level manufacturers, enabling users to integrate manufacturing operations and supplier coordination and increasing visibility in the whole process of production. This manufacturing software offers manufacturing execution, product lifecycle management, financials, customer, HR, asset and supplier management. Manufacturing operations management – SAP offers management under various aspects of the manufacturing process, including supplier, asset and product lifecycle management. Manufacturing execution – all manufacturing processes can be planned and implemented in a strategic approach. 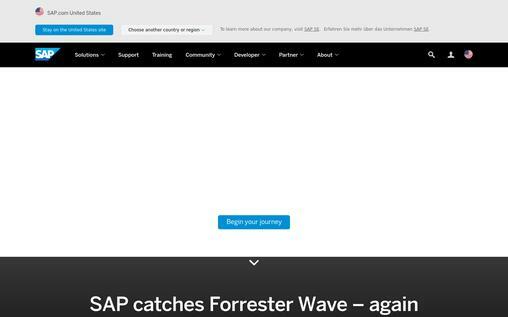 Integration – SAP offers integration capability with other types of enterprise solutions. Agile manufacturing – carry out production in an easy and quick approach to achieve your customer base needs. Sales and marketing – integrate your manufacturing together with sales and marketing to ensure that products are produced and sold effectively. Real-time supply chain – establish a functional way of managing your supply chain in real time. SAP Manufacturing is ideal for all types of industries. Pricing plans and demos are offered by the developer by making requests. Aptean ERP software is specifically built to cater to the needs of manufacturers in various industries including cable, metal manufacturers, engineers, etc. It is equipped with specialized functionalities that address business challenges faced by all manufacturing industries. Other manufacturing industries can also find it useful. It offers flexible, customizable and rich toolsets that can effectively handle all operations of discrete manufacturing firms. 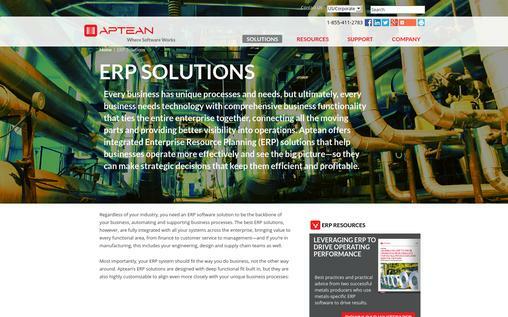 Aptean ERP features a number of manufacturing ERP solutions such as Axis ERP, Encompix ERP, Intuitive ERP and Made2Manage ERP to cater for metal industry, engineer-to-order firms, regulated product manufacturers and small to medium-sized manufacturers respectively. Manufacturing process management – gives the manufacturing team a complete visibility and control over orders, materials and quality with the inclusion of proper planning and execution. Customer service support – facilitates delivery of satisfactory quotes, custom product configurations, special pricing and accurate deliveries. Financials – facilitates integration with the operations such as accurate costing and reporting in real time. Supply chain management – makes it easier to establish real-time communication with partners, suppliers and vendors for an efficient planning, production and delivery of produce. The detailed information regarding the usage and pricing can be obtained by contacting Aptean experts. Ramco ERP on Cloud is an enterprise resource planning software that helps an enterprise manage every facet of production. It allows businesses to access data in real time, which is related to the manufacturing process as well as supply chain, financials, customer management and many more. Ramco ERP on Cloud features various modules which an enterprise can choose that it needs then upgrade later on as its needs increase. 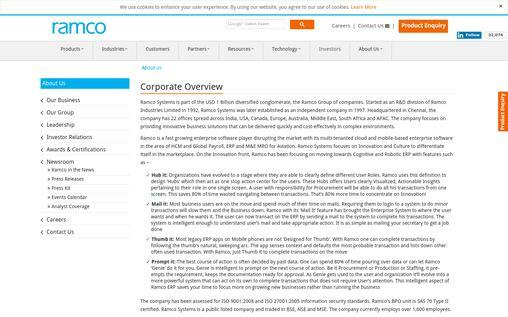 It can be deployed either on premise or on cloud, supported by Ramco VirtualWorks platform. Manufacturing execution – it lets manufacturers produce high quality products with same consistency to meet client preferences and keeping up with the evolving industry compliance requirements. Customer relationship management – this is suitable for responding to the changes in customer preferences so as to build good customer relations. Manufacturing process management – features powerful tools and comprehensive metrics for management of end-to-end manufacturing businesses. Integration support – provides support for integration with many industry processes, including procurement, inventory management, supply chain planning, asset maintenance, sales and marketing and business analytics among others. Ramco ERP on Cloud is recommended for those manufactures with more than $25 million revenue annually across various industries including consumer products, automotive components, hi-tech, industrial products and machinery, steel, precision products and others. Pricing plans can be provided by requests. 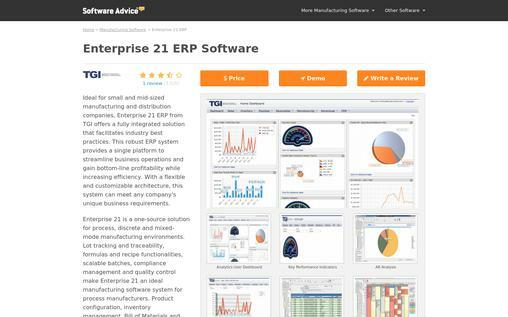 Enterprise 21 ERP is a manufacturing software solution by TGI, ideal for the small and medium sized manufacturing and distribution firms. It’s a fully integrated ERP solution that help companies carry out best industry practices. Enterprise 21 ERP offers a single-source solution for the mixed-mode and discrete manufacturing companies. It enables easier lot traceability and tracking, scalable batches, quality control and compliance management. Compliance management – Enterprise 21 makes it easier for manufacturing firms to adhere to the compliance requirements in their product manufacturing process. Product configuration – it becomes easier to configure products during manufacturing process so as to adhere to the customer preferences. Inventory management – this also includes management of warehouse and shipping. Manufacturing execution – helps in creating a suitable strategy through which manufacturing processes are executed to produce products with quality consistency. Component substitution – substituting components in a recipe during manufacturing process is automated to become much easier. Enterprise 21 ERP is suitable for all sizes of manufacturing industries and suits a wide range of industries including food and beverage, chemical industries, consumer products, plumbing products and more. Detailed information on pricing can be obtained through requests. 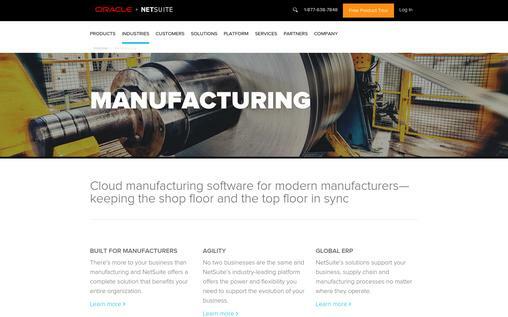 NetSuite is ideal for manufacturers who need production as well as assembly benefits from a manufacturing software. It is a fully integrated system featuring the inventory management, accounting and finance management, warehouse management, customer relationship management and ecommerce. It can be used by manufacturing firms of various sizes. It can be deployed through Software-as-a-Service cloud deployment. Production order management – manufacturers can easily and effectively schedule production processes so as to make deliveries on time. Partner relationship management – this is aimed at helping companies establish better business relations with their customers and suppliers. Inventory management – can be used to ensure that inventory is restocked appropriately according to the market forces on ground. Integration with mainstream carriers – NetSuite also supports integration with shipping processes like FedEx for easier management of warehouse and shipping orders. Lead tracking – it makes it easier to track leads and convert them to finalized orders as well as tracking association between revenue and production in manufacturing processes. In addition, NetSuite also features a highly customizable dashboard that provides accessible tools for monitoring business operations in real time. Other features include quality management, shop floor control, supply chain management and procurement. It can be used by various industries including food and beverage, fashion clothing, housewares, medical devices and pharmaceuticals and electronics. More information on solutions and pricing can be obtained by request. This is a manufacturing software solution with a 100 percent cloud deployment, designed for small and mid-sized manufacturers. It is most suitable for use by manufacturers who use Excel, QuickBooks or paper folders and are after streamlining their operations, boost visibility and revenue. Exact for Manufacturing provides total functionality for job scheduling, job creation, material requirement planning, shop floor control and manufacturing execution. Inventory management – allows users to access real-time inventory data featured with shop floor control where users benefit from up to date insights into stock levels and rates of depletion. Quality management – made possible through track and trace functionality. Allows you to comply with the legislative requirements. Reporting – offers support for extensive reporting functionalities for manufacturing processes. Order management – allows you to easily create production and purchase orders directly. Quote management – allows users to create, calculate and manage quotations with ease. BOMs can be created directly from the customer requests. Exact for Manufacturing has pricing plans starting from £339 per month. Sage ERP is manufacturing software suite ideal for small to the enterprise level distribution and manufacturing firms. It features a number of portfolios including Sage ERP 300, CRM, Pocket HCM and X3. Sage ERP software solution supports repetitive, process modes, make-to-order and make-to-stock manufacturing. It also provides functionalities for inventory control, accounting, shop floor control, material resource planning, supply chain and HR management. This software solution is best used by manufacturers and distributors who have annual revenue amounting to $6 million or more. Inventory management – can help manufacturing firms establish better inventory and supply chain management processes. Customer relationship management – firms can establish important links that connect them with their customers and device better ways of improving them. Revenue management – Sage ERP solution can facilitate faster and accurate tracking of revenue. Payroll processing – an automated and seamless way of processing payrolls. Manufacturing process management – offers an efficient way of managing engineering and manufacturing processes. Quote management – provides a faster way of creating and managing quotes. Sage ERP software solution is ideal for discrete manufacturers across a wide range of industries, such as electronics, consumer products, auto components, steel, precision products, process manufacturers and many more. Pricing plans and quotes are provided upon making a request. 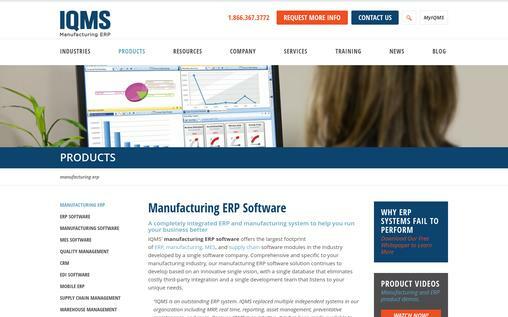 These are 10 of the most commonly used ERP software solutions by manufacturers across various industries. Most of these software are designed to meet the needs of small, medium and enterprise level manufacturers, so finding a suitable one won’t be much of a problem.